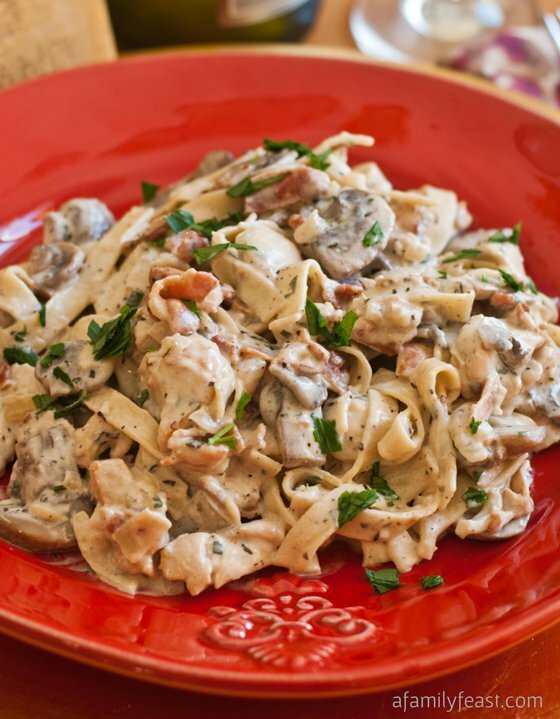 A delicious and creamy pasta with chicken, mushrooms, parmesan, cream and herbs. In a large saut� pan over medium high heat, combine 1 tablespoon each of olive oil and butter until melted and frothy. Working in two batches, add in chicken and brown on all sides, about 3-4 minutes per batch. Do not over cook. Remove chicken to a flat plate to cool and stop the cooking process. Place the bacon in the same pan and cook until it is crispy. Remove to paper towels, chop and reserve. Visit Chicken Boscaiola @ afamilyfeast.com for full instructions.